"Seguramente uno de los grandes acontecimientos de nuestros días ha sido el surgimiento y desarrollo de lo que popularmente se conoce como home schooling, y que yo prefiero describir como educación en el hogar. Detrás de este desarrollo hay mucho más que una reacción a lo inadecuado de tantas escuelas organizadas en Norteamérica. De hecho, es más un acto de divina providencia que el resultado de factores meramente humanos. A mi juicio, no es nada menos que un regalo de Dios que espero poder ayudar a apreciar y usar para mayor gloria de Dios". P. John Hardon S.J., Siervo de Dios. Donde poner Norteamérica, podemos poner España. Encomendamos muy especialmente al P. John Hardon el trabajo por el apostolado del homeschooling aquí en nuestro país. Podéis leer en el enlace arriba facilitado sus conferencias a los padres "homeschoolers". A continuación os pongo un artículo, por ahora en inglés a la espera de poder traducirlo, o de que algún voluntario nos haga la caridad. In Thomas A Kempis’ masterful Imitation of Christ, he asks “Why are you afraid to take up your cross, which leads to the Kingdom?” His answer is at the heart of Christianity. In the cross of salvation; in the cross is life; in the cross is protection from your enemies. In the cross is the infusion of heavenly sweetness; in the cross is strength of mind; in the cross is joy of spirit. 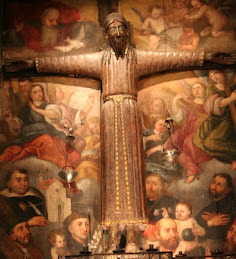 In the cross is the height of virtue; in the cross is the perfection of sanctity. There is no health of soul no hope of eternal life but in the cross. Take up your cross, therefore, and follow Jesus, and you shall go into life everlasting. I could not think of a better introduction for speaking on The Price of Home Education, Carrying the Cross. Catholic home education belongs to the heart of our faith. Why should Catholic home education require carrying the cross? The rewards of Catholic home education. You will notice that I am addressing myself to Catholic home education. Both words “Catholic” and “Home Education” are crucial to a correct understanding of our subject. Home Education in the United States is widespread. In fact most parents involved are not professed Catholics. Our focus is of course on the reason why Catholic home education is so precious. Moreover, it is wiser to speak of home education rather than home schooling. Why? Because home schooling is a loaded term which immediately arouses the antipathy of those professional educators who see home schooling as a direct challenge to their own profession. When Christ instituted the sacrament of matrimony, He gave the married couple a two-fold obligation: to cooperate with God in the procreation of children; and to cooperate with the Incarnate God in preparing their children for eternal life. Home education is evidently an answer to the second responsibility which the Savior has placed on the shoulders of Christian parents. Immediately we must distinguish between Catholic home education as such, and the education which Catholic parents are to give their children at home. While our focus here is on the first understanding of Catholic home education, we dare not ignore what is of the essence of our faith, namely, that parents must, the imperative is a revealed truth, must give their children a thorough Catholic education at home. This is so crucial that, if parents neglect their duty on this level, they endanger not only their children’s but even their own salvation. Why? Because the parents are the principal human channels of grace for the children whom they have physically brought into the world. To neglect this parental duty is to be wanting in the most fundamental imperative of father and mother, to prepare their offspring for an eternal destiny. In the United States too many parents have relied on the schools to train their children in everything, including religion. The moral revolution in Western society has awakened these parents. They are beginning to realize their own primary responsibility, as parents, to provide for the religious nurture of their children. Many factors have entered our society which gave rise to what is commonly called “home schooling,” but, as explained, I prefer to call it home education. Not the least of these is the powerful forces at work, consciously shaping the minds of the young in what can only be called the non-religious philosophy of practical atheism. The Second Vatican Council declared that practical atheism is the single most devastating factor undermining Christianity in the twentieth century. Practical atheism has deeply penetrated Western society and, with emphasis, the United States. In 1955 the Russian government published an official directive on, “Atheistic Education in the School.” This directive is only more out spoken than similar directives in the educational circles of our country. It spells out in several thousand words how religion should be eradicated from the minds of the young. To begin with, by the eleventh month after birth, the law declared that a child no longer belonged to the parents but became a ward of the State. As you read the Statement of Principles and Policy on Atheistic Education in Soviet Russia, you begin to realize how these principles and policy have penetrated our own nation. The freedom which parents still have to teach their own children is being taken over by one government controlled agency after another. Behind the state control are literally billions of dollars, whose one avowed purpose is to shape the next generation of Americans in atheistic materialism. We who have the true faith know what is going on and home educating parents have no doubt about the option. Either they allow the powerful secularizing agencies of our society to reshape their children according to the philosophy of godless secularism, or the Catholic faith of millions of still professed Christians is in jeopardy. Let us be clear. There is only one real issue at stake. Will our children remain Catholic not only in name but in reality, or will they become further casualties of a world-wide propaganda of secularization whose only surviving principle is what does this world still have to offer me? The spiritual world of God, and the angels, and human souls which are not perceptible by the senses are defined in the dictionary as nonsense. Only dedicated home educators would associate their generous apostolate with the cross. Since the cross is the patient acceptance of God’s will even when contrary to our own will, suppose we identify some of the crosses which home educating parents have to face. Domestic duties. As every home teaching parent knows, there is no limit to the domestic duties that they have to perform. The children have to be cared for. The younger they are, the more attention they constantly deserve. They have to be fed and clothed and washed. Shopping has to be done; the house has to be kept in order. Washing and ironing have to be done. The telephone has to be answered. Food has to be bought and prepared. There is no limit to the twenty-four hour day that devoted parents must devote to provide for just the normal upbringing of their children. Social responsibilities. Families are not living in isolation. They have friends and visitors, callers and persons outside of the household for whom to care. The parents have their own in-laws who should be kept in contact with. The children have their friends to be both visited and to invite as visitors. There is a whole business of providing for the financial support of the family and the numerous pressures from state and other agencies constantly interfering in family affairs. Unacceptance by others. Over the years so many home educating parents have told me how isolated they can become from their neighbors and friends. Needless to say not all parents are engaging in home education. In fact, the majority are not. There are few more painful experiences for parents who make the sacrifice of teaching their own children than the misunderstanding, un-acceptance, open criticism and even organized opposition to their home apostolate. What makes this more difficult still is that these critics are usually members of ones own family, grandparents and in-laws and relatives. Sacrifice of social availability. To combine the care of a home with all its manifold responsibilities and engage in home education, I do not hesitate saying borders on the miraculous. The priorities which parents give to the training of their own children necessarily mean giving up so many perfectly normal and praiseworthy social relationships with other people. This is more than a matter of time; it is a decision of priorities. Parents must decide what is more important before God: to provide for the sound religious education of their children or to engage in perfectly normal and deeply satisfying social relations with others. Governmental pressures. States in our country differ. Some are more lenient and others more severe in their attitude towards home education. Parents have actually been imprisoned in our country for not conforming to certain statutes determined by those who are trying to control the education of our children. But even without strong legal pressure from governmental agencies, home educating parents must expect to be subjected to all kinds of coercion from agencies that see home education in competition with their own bureaucratic organizations. Loss of our Catholic schools in America. The widespread secularization of teaching religious communities in our country has led to the closing of most of our once flourishing Catholic schools. This has left such a vacuum that there is no counterpart for it in over two hundred years of our national history. Twenty six years in working for the Holy See in trying to preserve authentic religious life in our country has taught me many things. Not the least of these is that one factor which has mainly closed down our Catholic schools is the intrusion of alien ideas into what was once a thriving religious life in our country. The very values that parents want to pass on to their offspring are the values which so many once devoted consecrated religious had professed and promoted in the Church related schools in which they had taught. The consequence has been obvious. What the parents want to share with their children are the very values which so many in our formally flourishing Catholic schools have replaced with a new philosophy of their own. Lack of cooperation with Church authorities. Following on what we have just said, Catholic home educating parents in many places find it difficult to have their children accepted in a parish for the reception of the sacraments, especially First Confession, First Holy Communion, and Confirmation. In various parts of the country where I travel, I have found that parents will literally travel hundreds of miles to another diocese at another parish where their home educated children can receive the sacraments on a regular and not defensive basis. This can be a heavy trial to fathers and mothers who love the Church dearly, who are loyal to her authority, but who also love their children so much that they are willing to make any sacrifice to insure that these children receive a thoroughly Catholic upbringing. The children’s friendships. Not a small trial that parents engaged in home education have to face is how to provide for the companionship which their children need with young people their own age. As we know peer pressure is the single most powerful influence on young people. How other children behave, what they believe, what their moral and spiritual habits are, how they talk, what sports they engage in, what reading they do, what radio they listen to, what television they watch, what entertainments they have, what trips they take, who their parents are, whether they come from stable or broken families, how much they pray, what religion they profess, how they resist the natural pressure to the use of drugs, how they dress, what language they use - so the litany goes on - all of these are powerful influences on the young. Catholic parents would be out of their minds if they did not seriously take into account who their companions are and how their friends affect their own moral and spiritual lives. One large contributing factor to the rise of home education in our country is precisely how to cope with the social influences to which the children are constantly exposed in going to school. Isolation from social relationships is not the answer. If a family is large, this will partly compensate by providing companionship among the children in the same family. The need for both providing sound social development for the children and protecting them from the adverse influences of peer pressure is evident to anyone who knows the American scene. Parents who are dedicated to the home education of their children are willing to pay the price for their apostolic zeal. They have no doubt that this does mean carrying the cross. They have no illusions about the price of the cross. But they are also willing to both carry the cross and to pay the price. The issues at stake are far deeper than most people realize. At root is a principle of our faith which tells us that in God’s providence we are to be the channels of faith to those whom God puts into our lives. This is no option but an obligation. If this applies to every follower of Christ, it applies with resounding emphasis to the parents of their offspring. God has given parents an extraordinary role in His mysterious providence over the human race. The fathers and mothers who bring their children physically into the world are also the ones whom the Creator has chosen to be the principal agents for communicating His grace to those whom God has enabled them to reproduce themselves physically by procreating their offspring. No words can describe what blessings the Lord will provide for those parents who love Him so much that they are willing to sacrifice everything, and I mean everything, in order to insure that the children they have brought into this life will be reunited with their families in that eternal home for which families come to being. The first reward of home education I would say is the deep peace that both parents and children can expect where the children are home trained to live out their Catholic heritage. I contrast this peace with the agonizing conflict in so many Catholic parents’ souls who see the children they brought physically into this world who are not prepared to enter the eternal world for which they were born. Another reward for carrying the cross of home education is the promise which Christ Himself made when He told His followers, “I have come that you may have joy, and have it in abundance.” Happiness is the satisfaction of human desires. The deepest need of the human mind is to know the will of God, and the deepest joy is to do this will according to His divine will. As Catholics we believe we have the fullness of God’s revealed truth. Whatever else home education is meant to provide, it gives the children as much of this truth as God’s grace and their own native abilities can absorb. There is no joy without the truth. There is only as much joy as a person knows the truth. And there is only as much happiness as, those who know the truth, put into practice. Is there anything under heaven more beautiful than a happy family? One final reward of home education. Our country is the most unstable, the most divorced, the most contraceptive, the most medically tranquilized nation in the world. Why? Because everything which God became man to teach families on how to be happy is being challenged, opposed and even legally persecuted by the educational powers of our society. Let us have no doubt that the United States is undergoing a massive persecution for the true faith. In his encyclical, The Splendor of Truth, Pope John Paul II urges the faithful to be prepared to live heroic lives. Indeed, he tells them to welcome the gift of a living martyrdom if they wish to remain faithful to God, who so loved our sinful human race that He died on the Cross to prove His love. This exhortation to live martyrs’ lives applies especially to the mothers and fathers who welcome the cross because they love the Crucified Christ and want to join their children with the Glorified Christ in a heavenly eternity. Mary, Mother of the Holy Family and Mother of your Crucified Son, obtain from Jesus the grace that home teaching parents need to persevere in their loving apostolate into eternity. Amen. Prado ya nos hizo la caridad, y más arriba está el texto traducido. Muchas gracias por compartir este material, me va a servir muchísimo!! Quiero pedirte tus oraciones, pues estoy invitada a hablar sobre el homeschooling el próximo 7 de junio en EWTN. Si tienes oportunidad, te invito a que contestes una encuesta que tengo en la barra iaquierda del blog de Familia Católica y si puediera ayudarme a promoverlo, te lo voy a agradecer. Hay mucho que quiero decir, espero ser una buena representante del Homeschooling católico, con la gracia de Dios. Un abrazo.